A Maryland man escaped serious injury after an accident on Interstate 95 in Island Falls on Saturday, Aug. 11, 2013. 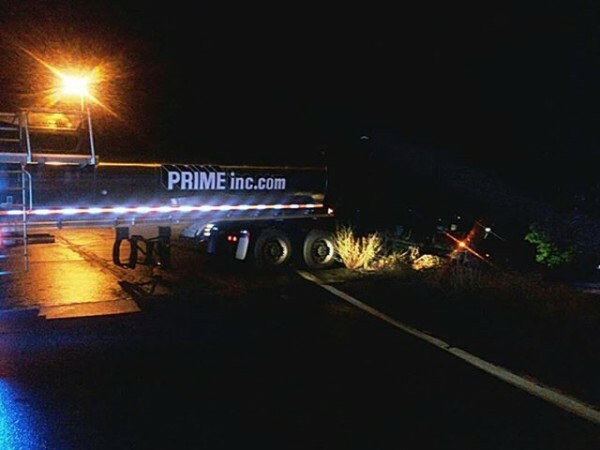 Garcia Cragey was operating a 2014 Freightliner and tanker trailer belonging to Prime Inc. when he failed to make the turn at the end and crashed through the guardrail on the north side of Route 159. Cragey, age unavailable, was not injured. The guardrail kept the truck from continuing over the steep embankment. ISLAND FALLS, Maine — A Maryland man escaped serious injury just after midnight Saturday when his tanker truck struck a guardrail as he tried to take a detour off Interstate 95 in Island Falls. The crash happened at the I-95 off ramp in Island Falls, an exit which is the start of a detour to avoid construction on the interstate north of that location, according to Chief Deputy Darrell Crandall of the Aroostook County Sheriff’s Department. Garcia Cragey, whose age and address were not available, failed to make the turn at the end of the off ramp and crashed the 2014 Freightliner through the guardrail on the north side of Route 159, Crandall said. Cragey was not injured, the chief deputy said. Crandall said that the guardrail kept the rig, which is owned by Prime Inc., from continuing over the steep embankment, but the tractor trailer blocked Route 159 for about an hour. The tanker was filled with vegetable oil destined for Easton and was not damaged. The tractor, however, sustained significant front end damage, including a ruptured diesel fuel tank. Workers with the Maine Department of Environmental Protection and the state Department of Transportation responded to assist deputies at the scene. Deputies had all northbound traffic stopped for about an hour while the truck and trailer were removed from the scene.